Snowboarding is the cool little brother of skiing. It started off as a rebellious alternative to skiing, with links into the surfing and skiing communities. Like surfing and skateboarding, snowboarding involves standing sideways and sliding down hills on a single piece of equipment. Unlike surfing and skateboarding, participants are connected to their boards using bindings. In comparison to skiing, snowboarding boots are much softer and more flexible, and rather than stepping into bindings like you would on ski's, you use toe and ankle straps to keep your feet firmly slotted into the bindings. 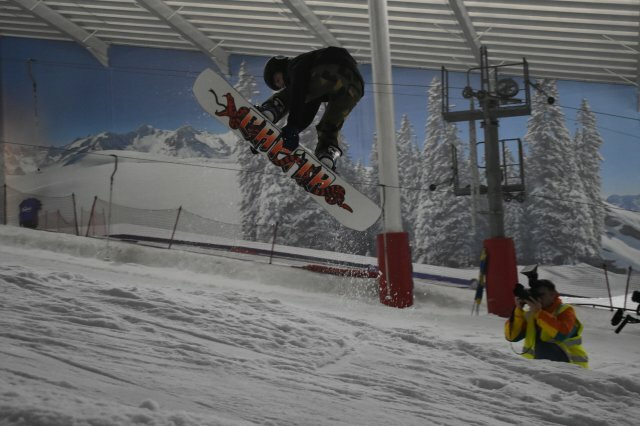 Snowboards are wide and allow you to surf through soft snow and carve around crisp pistes with ease, as well as taking to the snowpark and hitting the man-made features. Whether you want to try throwing spins and flips off jumps, sliding along handrails or just charging the pistes as quick as you can – snowboarding is a really enjoyable sport. It's suitable for all ages, and if you'd like to get into the freestyle side of the sport then most facilities in the UK have a designated "Freestyle night". You can also satisfy the speed demon inside you and race 3-5 other people down a course full of banked turns, bumps and jumps in the thrilling sport of snowboard cross! Visit our activity finder to find sessions near you.